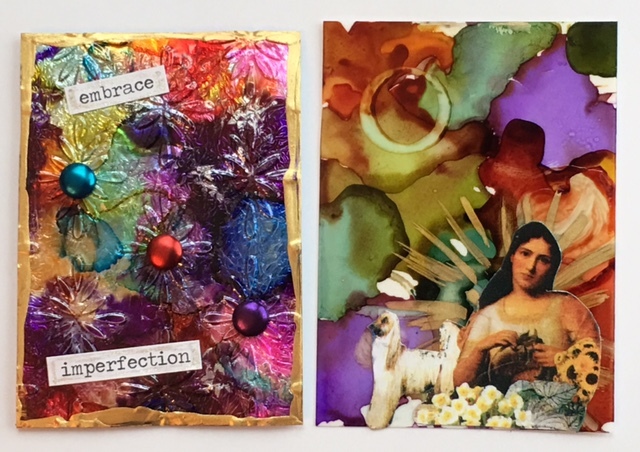 I wanted to squeeze in a card for the From the Heart Progressive Challenge- we have until the end of the month to get 'er done! I used Copics to color the cute image. 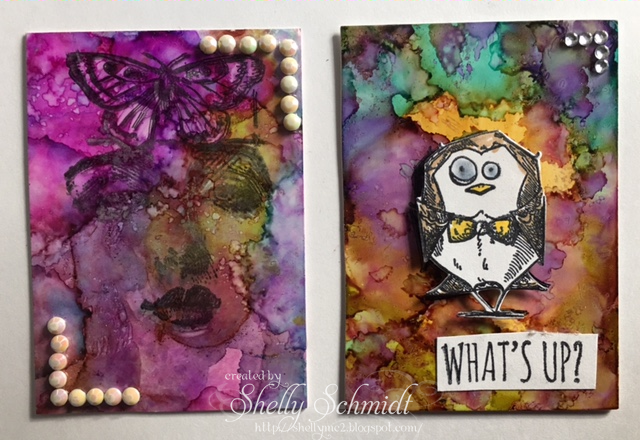 I made the frames out of MME Lost and Found Breeze DP using Gina Marie dies. The button is from SU. I love the way this bird is looking up to the sky with the sweetest smile ever! I decided that I was going to use whatever DP was first when I opened up the drawer they were in, I was lucky that there was green in the mix. 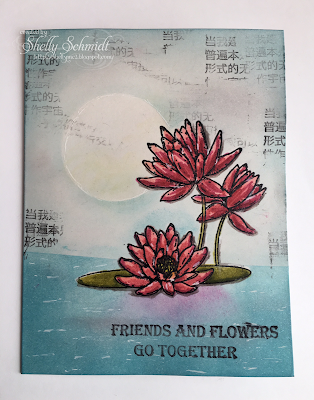 I cannot remember the last time I used a background image like this with embossing powder!!! 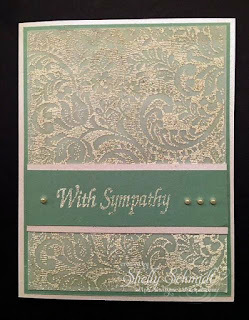 This is called Victorian Lace (Stampin Up) and I bought it around 2001. 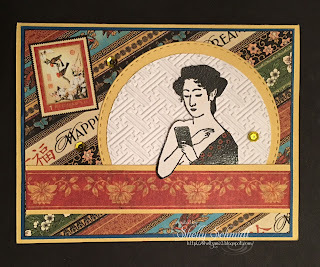 It is stamped onto vellum using Versamark and embossed using Fantasy Ivory EP from Sweet Stamps (this EP has a gold glitter in it). 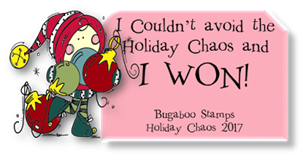 The sentiment is Sweet Stamps. 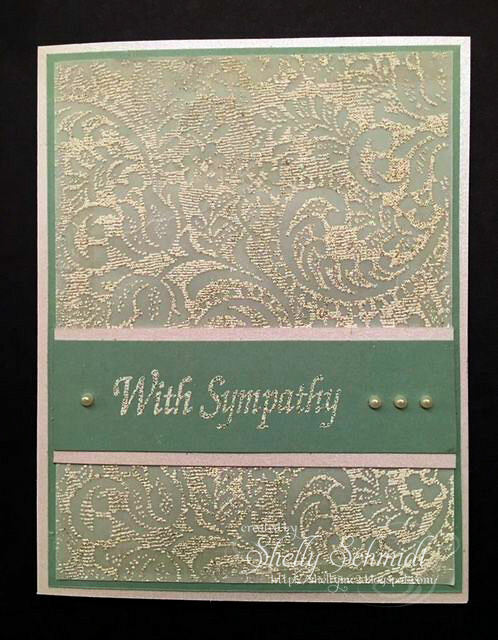 I also used retired cardstock Sage Shadow. I added three pearls, then decided it needed one more to the Lt of the sentiment. Well, this fits the recipe too.... I stamped and embossed onto vellum with white EP. 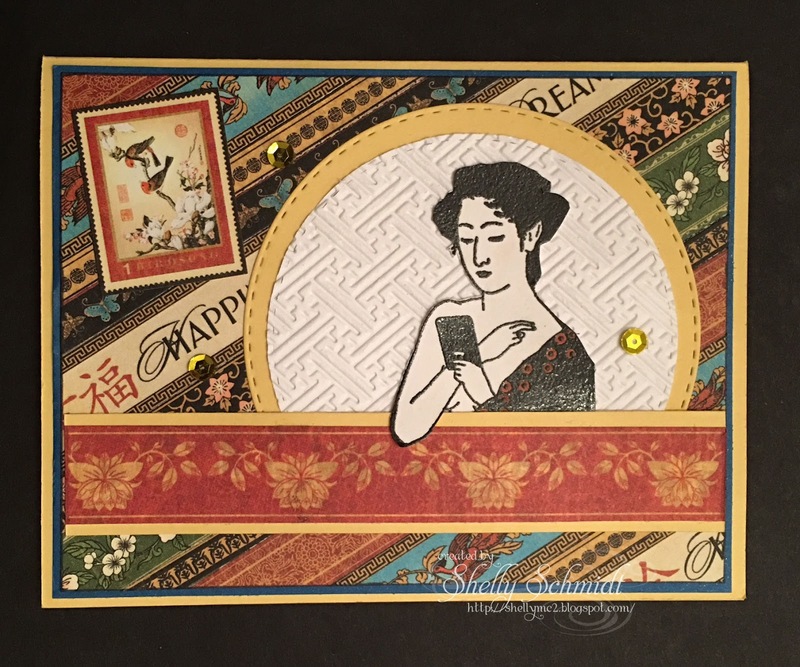 The Lilly stamp is by Michael Strong. 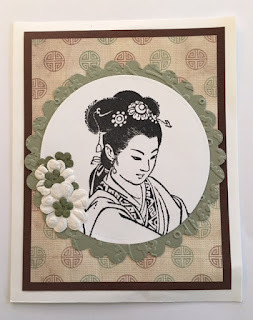 I old school colored on the back of the vellum using my SU markers and retired SU cardstock (pretty sure it is Lavender Lace). 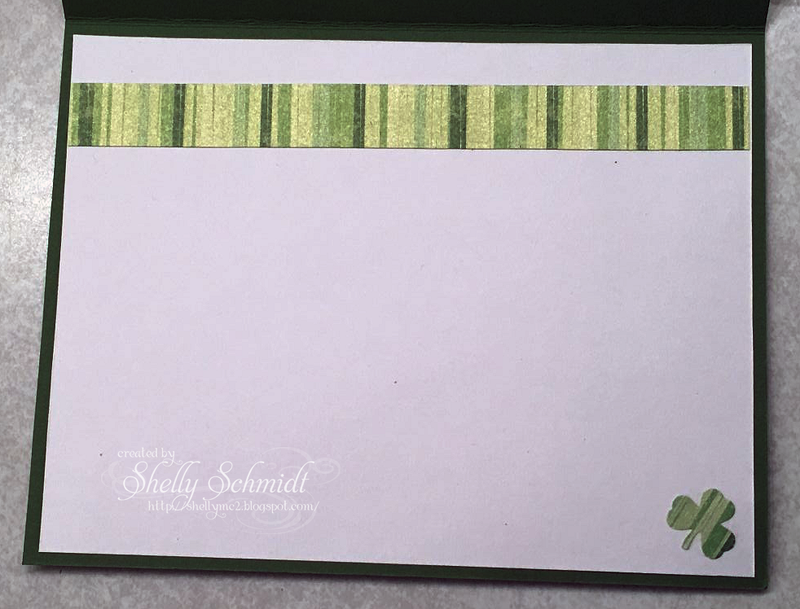 The green is Garden Green SU cardstock, that is dry embossed. 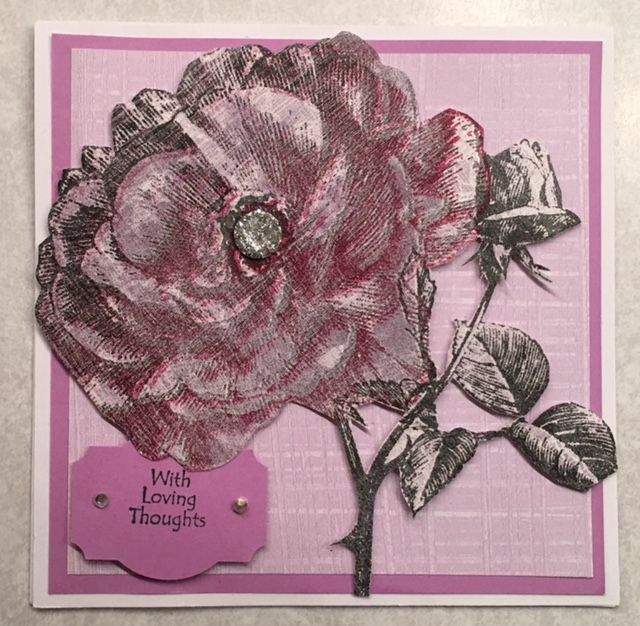 Wink of Stella was used in the centers of the flowers for a little sparkle. I added pearls in groups of three's to finish the recipe. 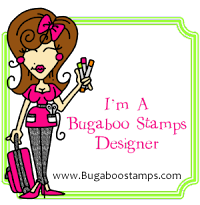 Thanks for the great group Barb- it is so wonderful to use all of these unused stamps and supplies ! 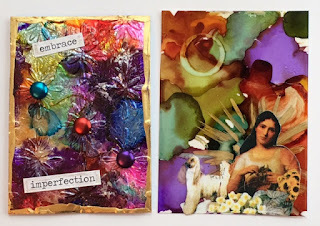 I am using 'older stuff' and enjoying every minute of it! I used a piece of a Simple Sumi (Technique Junkies) scrap- just big enough for one the large and one of the small seahorses. I stamped in Versamark ink, then embossed in black EP. 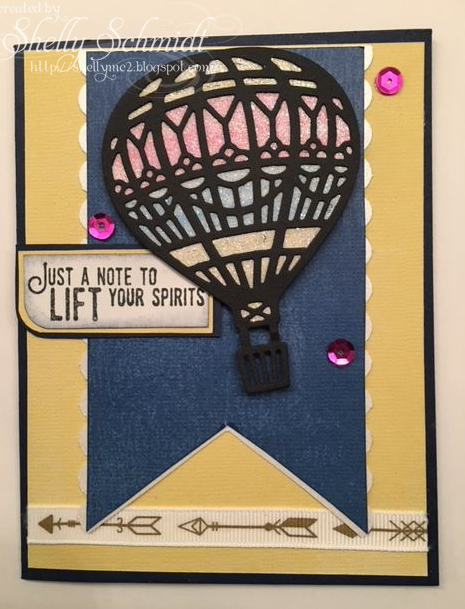 I sponged on the ink for the background. 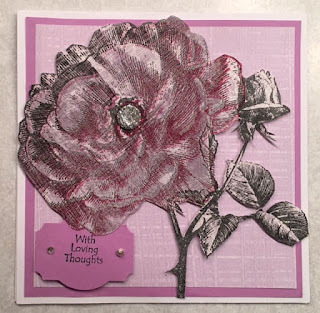 I added Crystal Effects on the bubbles, and added a few sequins here and there, then decided to add a seqins strip across the top of the card. 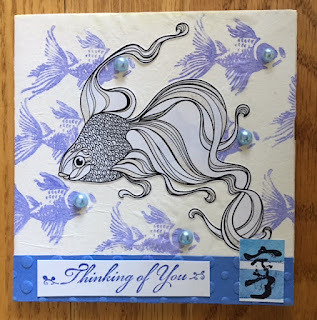 Something is fishy this month- and it is a mingle over at the About Oriental Stamp Yahoo Group. We can use fish image, and there has to be a stamped item. (And, it has to be Asian). I placed an order recently with Frantic Stampers, and received some Scrapbook Stickers- the fish being one of them, I added it over a Simple Sumi background- that was a Technique Junkie scrap : ) I used Basic Grey DP, added a rub on from the Target dollar spot (it is the design on the left side). The floral image up on top and the sentiment is from Clear Dollar Stamps (sadly, now closed). 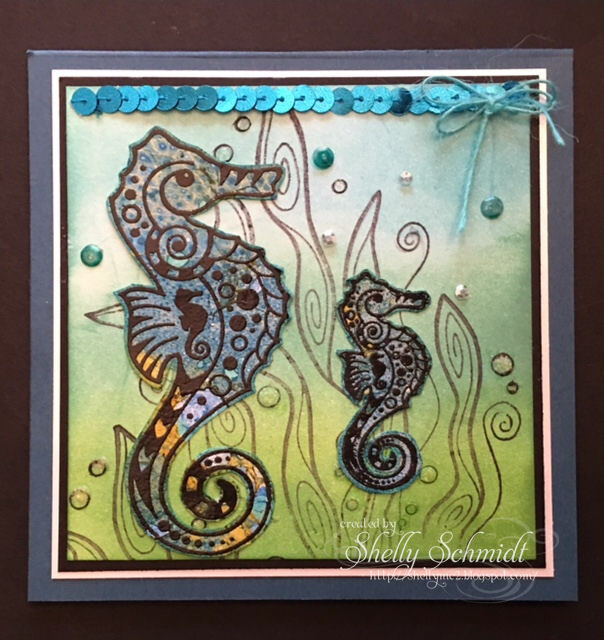 I love the fish image, and all of the pearls on the background she added. I have recently been on the go alot more than before, and have found Instagram- easy to browse on the go. Are you on Instagram? If so, leave a link to your Instagram so I can follow you there! The image is My Sentiments Exactly (SS106). The DP is Reminisce Stroke of Luck. It has a shimmery sheen to it- so pretty IRL. I am going to enter the Daring Cardmakers Green with a touch of Gold challenge. 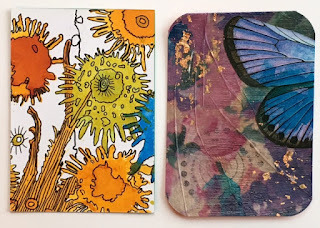 I made two cards from the awesome kit we received this month from Darling, the hostess of the Dazzlers. (The Divas hostess is LJ this month). 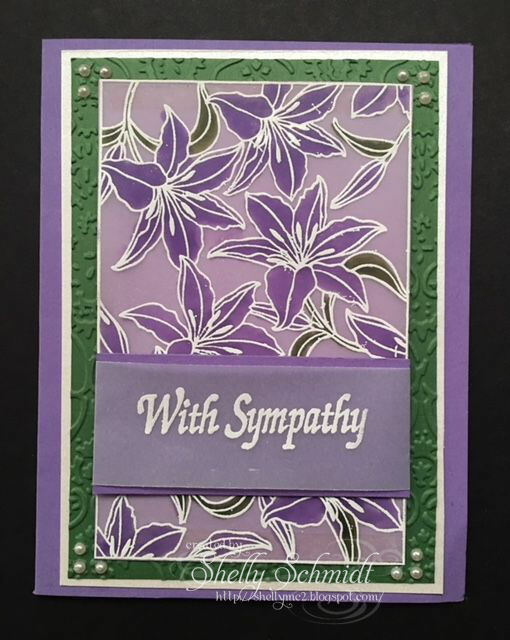 This shows the pretty colors Darlene sent for the backing a bit better. 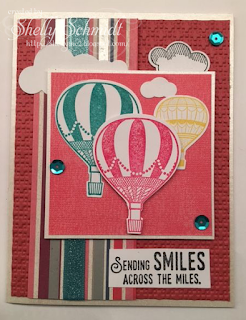 I used the Sunday Stamps Sketch challenge for this card. 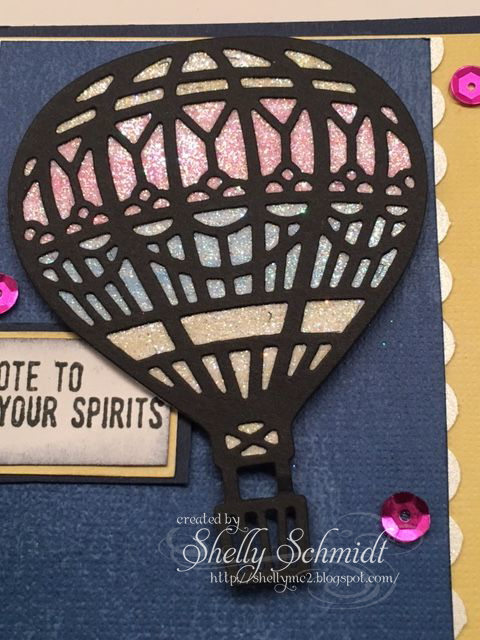 Die Cut and images from SU Lift me Up set. 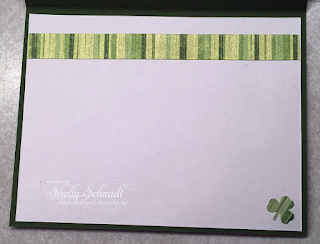 Stamped in SU Emerald Envy, Flirty Flamingo, Sweet Sugar Plum and Daffodil Delight. 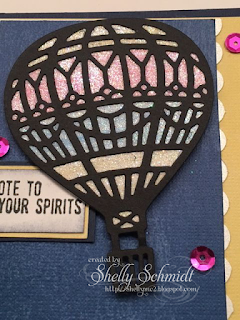 The die cuts for under the balloon (die cut) use the above colors and a SU blending pen smoothed out the colors. Ribbons are Hobby Lobby Ribbon Boutique. 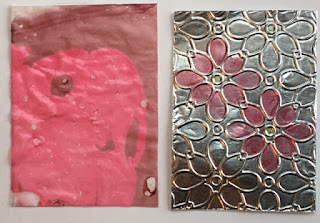 Sequins are The Paper Studio Spare Parts. 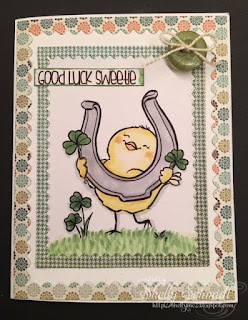 I love this pretty card : ) There is enough left over for another card too! I will not look at napkins the same again- isn't this lovely? We have enough to make 3 more of this one as well. 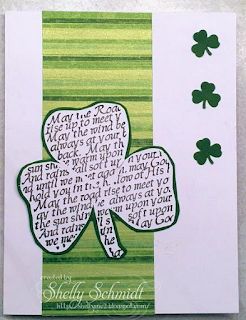 This fun one is perfect for a masculine card- enough supplies to make one more of this one each. 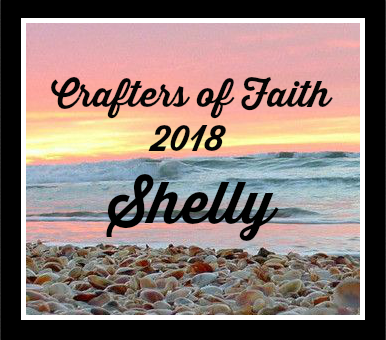 The designs are by Jan at Creative Crafts and More in Villa Park Ill. It was a fun class and at the perfect pace. 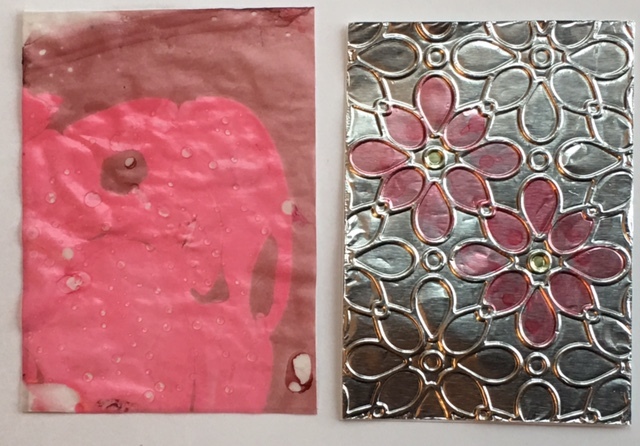 We did a little cutting/prep in advance which made the class go very smoothly. 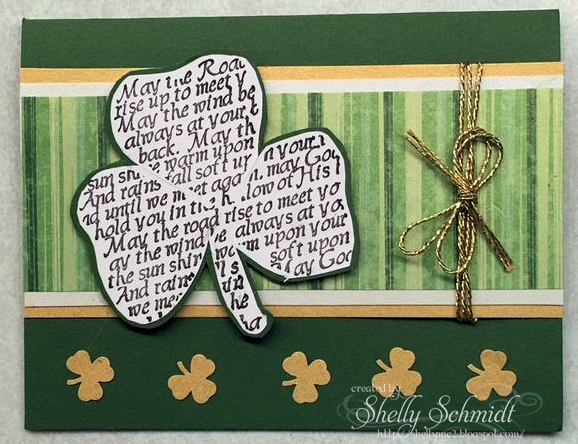 And, the insides of the cards are decorated as well. We are inspired to create each month on a reflection by a group member- this month is Liz, and we made Sunrise/sunset cards. Psalm 40:3 NLT: "He has given me a new song to sing." 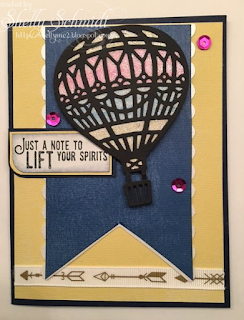 Inspired by a Zindorfian idea...LOL I made a scene with Distress inks and colored with Distress Markers- and it is a ONE layer card- no other embellishments- quite a challenge in itself for me!!! I ran a piece of acetate through the big shot and embossed it. Then , I dropped Yellow and purple AI's on a it. I added an Elizabeth Designs sticker on top. 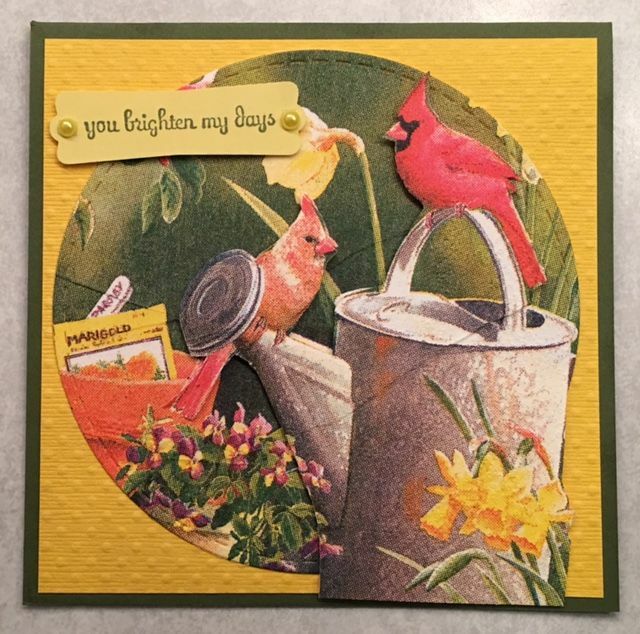 I am going to enter this into the As You Like It challenge- what do you make besides cards? 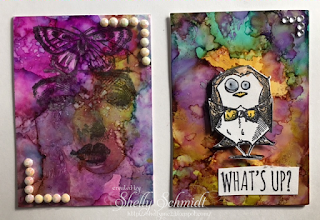 I love to make ATC's- so fun to trade these little pieces of art- and fun to look through my binders for a jump start to my creativity! Mary also added AI's on acetate, then added metal tape around the edges. There is a tag attached which has Mary's signature on it. I stamped a floral image by Technique Junkies over the red dots- love the way these turned out! Technique Junkies floral over a plaid AI background on the Lt. 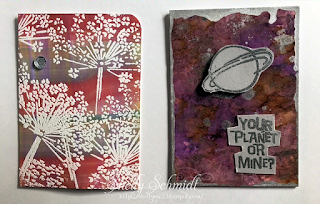 The Rt has a touch of Silver Metallic mixative, and then added the silver embossed spaceship from Stampendous. The one on the Lt is available for trade. 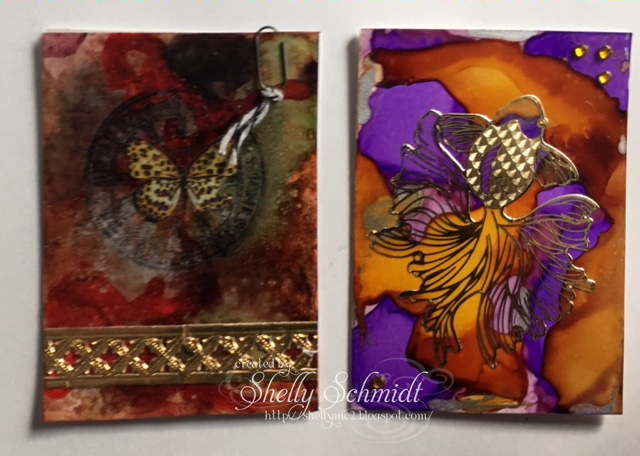 I stamped a TH image, added a butterfly rub on and added German scrap. 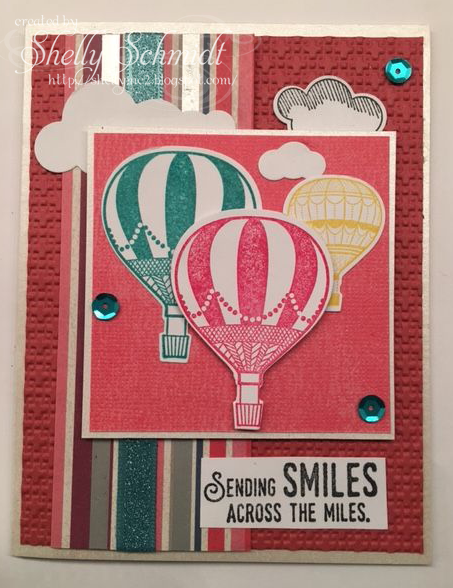 The one on the Rt has a scrapbooking sticker on it- from Frantic Stamper. 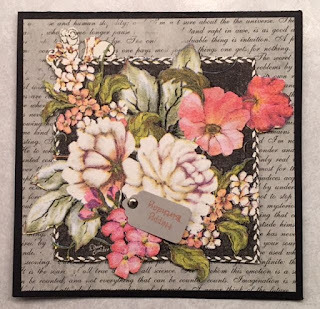 On the Lt- the images are from Technique Junkies- this is available for trade. 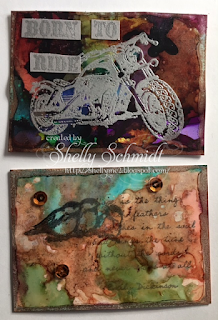 I love this- Linda doodled over the AI's- she blew on the inks after they were dropped onto the cardstock. 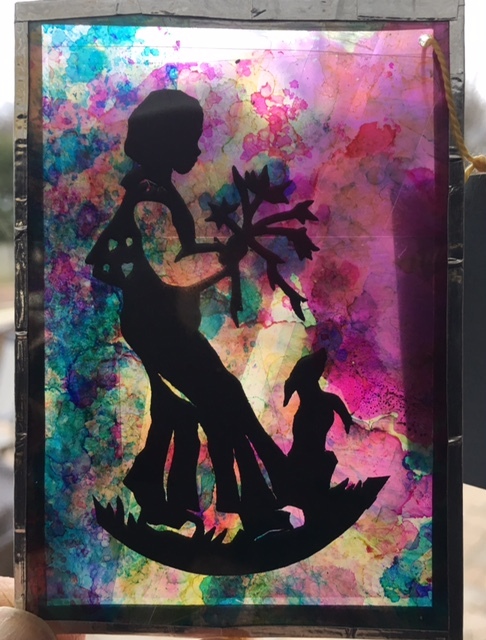 Mary added more acetate with AI's and put metallic tape on the edges- this one is backed so you cannot see through it like the drop card above. Diane added the inks on by dripping- isn;t that a great effect? 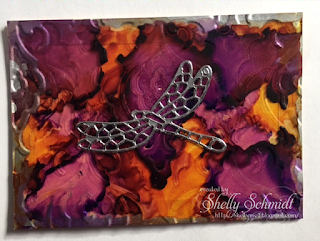 Rt- Marcie ut foil over an ATC then embossed it. 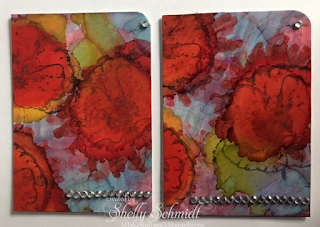 Next, she colored in the flowers. 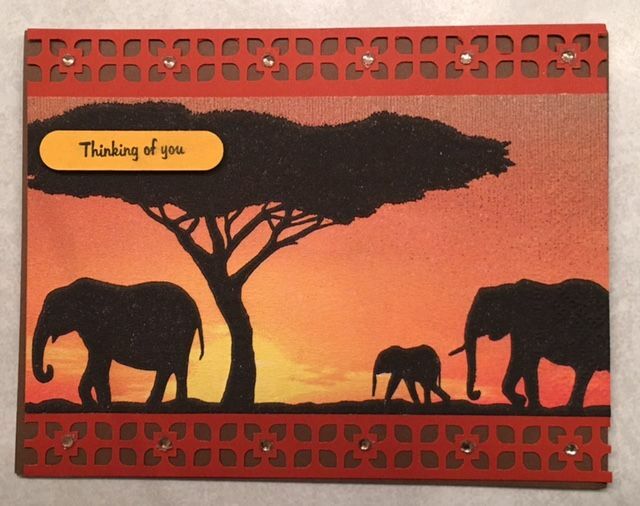 We have lots of mingles at the About Oriental Art Yahoo group. This is a card I made for the Asian Ladies mingle. 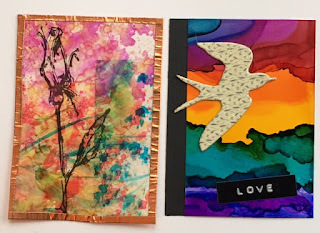 I took out some of my G45 coveted Birds Song DP and cut into it...... yes I did, I cut the design in strips and then layered them at an angel in the background- used the Xyron to make it sticky. 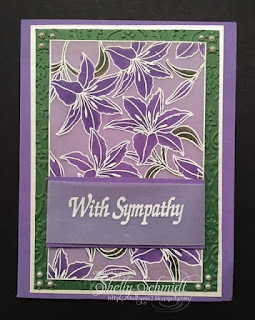 I stamped and embossed the image, whick was on white cardstock that I colored with a E000 marker. I colored in the flowers on the top with a Copic marker. 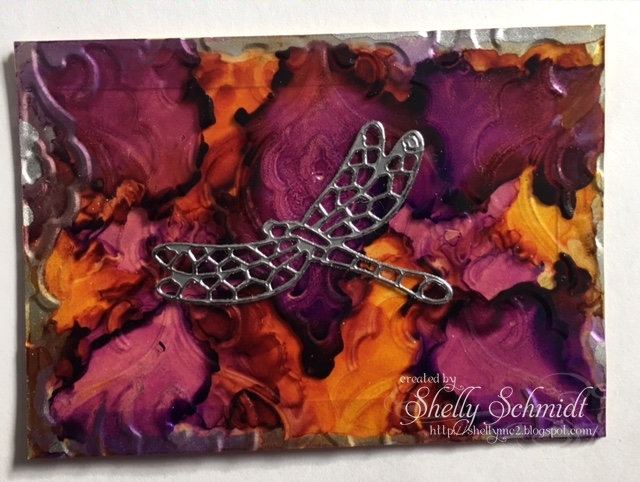 This image is on the Stonehouse Stamps plate #9. 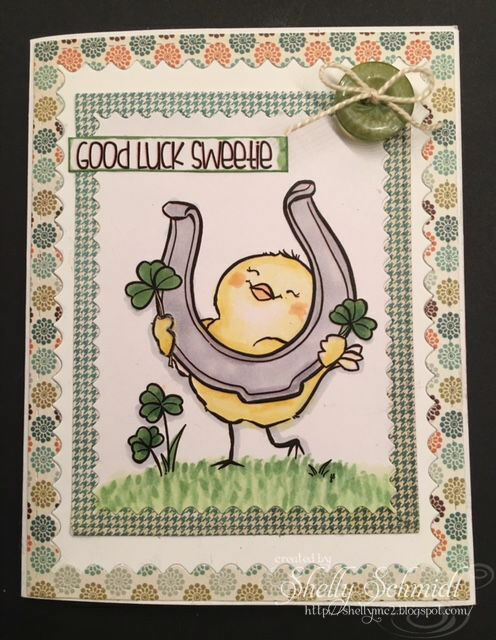 This is the card I received back from Wendy McGowen.